LOCATION.--Lat 42°57'28", long 77°04'05" referenced to North American Datum of 1983, Ontario County, NY, Hydrologic Unit 04140201, on right bank 25 ft downstream from bridge on Eagle Street at Phelps, and 1.1 mi upstream from Canandaigua Outlet. PERIOD OF RECORD.--October 1959 to March 1995, June 2002 to current year. REVISIONS HISTORY.--WSP 2112: Drainage area. WDR-US-2014: 2007(P). GAGE.--Water-stage recorder. 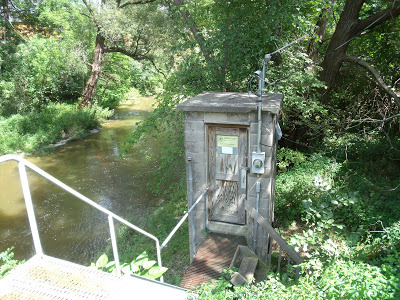 Datum of gage is 523.14 ft above NGVD of 1929 and 522.60 ft above NAVD of 1988. REMARKS.--Prior to about 1970, small diversion (during extended dry periods) by Phelps Cement Products, Inc., located about 0.2 mi upstream. Diversion at several sites for irrigation purposes. EXTREMES FOR PERIOD OF RECORD.--Maximum discharge, 3,740 ft³/s, May 16, 2014, gage height, 5.52 ft; maximum gage height, 6.20 ft, Mar. 17, 1963 (ice jam); no flow for many days 1962-65, 1969.